In an article recently published in the Journal of the Royal Society Interface, Cambridge researchers have reported on a new method to measure biomechanical noise in cells under normal growth conditions and when subjected to increasing levels of environmental stress. The new method may provide the basis for a tool to study complex disease mechanisms like cancer. The researchers; Abhinav Prasad and Ashwin Seshia (both Department of Engineering), Anna Huefner (Department of Physics) and Sumeet Mahajan (University of Southampton), studied the behaviour of neuroblastoma cancer cells (specifically the SH-SY5Y cell line) using an acoustic wave device, commonly referred to as the Quartz Crystal Microbalance (QCM). The QCM in its simplest incarnation can be used as a sensitive microbalance, responding to changes in surface-adherent mass through corresponding shifts in the resonant frequency of a thickness shear mode of the quartz crystal. Time-lapse measurements were conducted as the surface coverage of the adherent cell layer on the QCM was varied, both under normal growth conditions (under environmental control) and as the cells were subject to environmental shock by subjecting them to hyperthermia. The authors of the study also conducted the same studies using optical imaging using a phase contrast microscope and demonstrated a significant change in the dynamic response of the cells as they responded to varying environmental conditions including striking changes in motility and morphology. Ultimately, following prolonged stress, the cells undergo apoptosis and detach from the surface. The standard response of the QCM as measured by frequency shift and dissipation data did not show a clear correlation with the dynamic behaviour of the cells. However, interestingly an analysis of the resulting frequency fluctuations (the noisy response of the QCM sensor) showed a very striking correlation with the variations with cell motility and morphology. The authors used a technique, established in the timing and frequency control community to quantify the accuracy of crystal clocks in electronic devices, to analyse the resulting frequency fluctuations of the QCM. The use of the so-called "Allan-variance" is a time-domain approach to quantify noise in an oscillator and also provides the capability of resolving different operative noise mechanisms underlying the measured response. By comparing the noisy response of the QCM against a suite of control experiments, the authors established the potential to monitor the noisy dynamics associated with the stochastic behaviour of the cell population. The authors found a very clear distinction between the three different phases of the experiment – a noisy baseline response associated with cells under normal conditions, followed by an elevated noise level as cells responded individually and collectively in trying to cope with the elevated level of environmental stress followed by a drastic reduction in response following apoptosis where the noise level dropped to near that of the intrinsic noise level associated the operation of the sensor. Striking co-relations in noisy response could be made when compared to the dynamic variations in motility and morphology revealed through time-lapse optical microscopy studies. The authors believe that this technique potentially lays a unique foundation for future experimental studies to probe the nature of cell-substrate interactions under varying environmental conditions (often difficult to quantify using alternative techniques) but also a means of quantifying variations in cellular motility and morphology that may provide the basis for a tool to study complex disease mechanisms e.g. cancer. 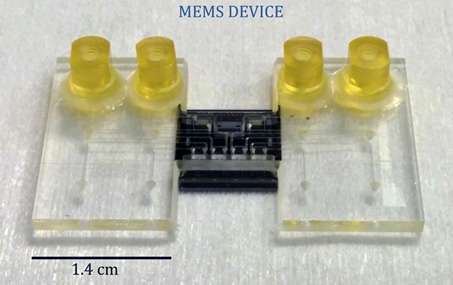 Dr Abhinav Prasad, lead author of the study, commented "We are particularly excited about future extensions of the technology to construct an integrated MEMS device where the dynamic mechanical response of single cells can be studied in real time. This platform could enable controlled studies to resolve the effects of drugs, toxins and environmental stress on the cellular response – almost impossible to achieve using other existing techniques." The image below shows the preliminary construction of such a device.